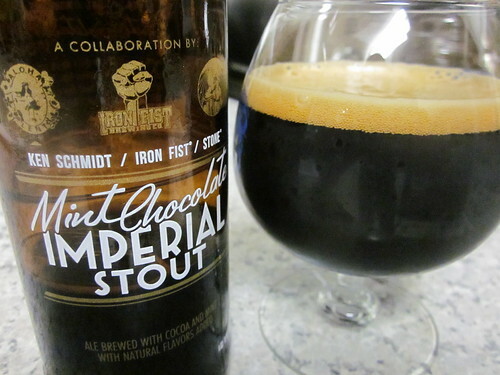 Ken Schmidt/Iron Fist/Stone Mint Chocolate Imperial Stout | Drink. Blog. Repeat. Stone‘s collaboration series has been AWOL for a while as the brewery’s celebrated its 16th anniversary and the 10th anniversary of Ruination. That’s been depressing as I’ve been a huge fan of all the collaborations they’ve put out this year, including TBA and More Brown Than Black. For the larger batch, the brewery used chocolate from ChocoVivo and organic chocolate mint and peppermint grown at Stone Farms. The result is an imperial stout that tastes of chocolate and mint. Bet you never guessed that. The collaboration has that standard imperial stout appearance. Pitch black with no light getting through it. There was about a half a finger worth of head on top made up of a lot of tight brownish bubbles. It lingered for a while, which was surprising for a higher ABV beer. The lacing and alcohol legs were really nice and held on for a while. A lot of reviews have described the beer as smelling like a liquified Andes mint, or one of those fancy mints you get on your pillow at a hotel. I can’t think of a more apt description. The rich, sweet chocolate and mint are right there from the get go. The mint is a nice, natural-smelling flavor. It’s a great touch, and it’s all self-explanatory. The flavor follows the nose perfectly. There’s a very slight bitterness on the front of the tongue, a medium body mouthfeel and some good carbonation across the palate. The chocolate develops first on the finish. It’s a good balance between sweet and dry. The mint rises on the very back and leads to a pretty dry aftertaste. For nearly 10%, the alcohol is just mildly present on the back. A lot of people have commented that they didn’t get much mint off this collaboration, but I thought it was a perfect amount. Not at all artificial or overpowering, it melded nicely with the chocolate flavors, which were also rich, but not overly strong. Another winner of a collaboration. Now I just have to bide my time until The Perfect Crime comes out.